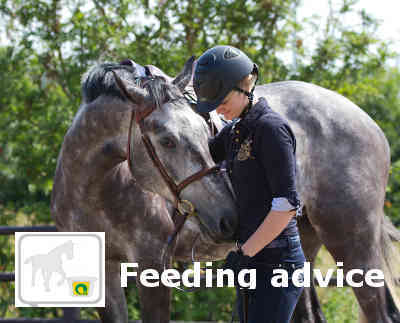 Every equestrian sport discipline requires its own way of feeding. For convenience we divide the equestrian sport into two categories. Energy Classic is a grain mix with oats for a high energy value with peak performance and high vitamin content. In different sports such as jumping, eventing and trotting, muscles are briefly loaded and the muscles require quick energy. Raw materials such as oats and barley contain relatively many quickly soluble carbohydrates such as sugar and starch. These carbohydrates are broken down by the enzymes in the stomach and the small intestine of the horse. This provides fast absorbable energy that allows the muscles to peak. During a sprint, energy is connected without oxygen. In this process, carbohydrates are converted to glucose and broken down into lactic acid and ATP. (Actual fuel). Lactic acid is a waste material that causes your muscles to "acidify". This type of combustion only provides a few minutes of energy. These carbohydrates are not only important for the use of the muscles but also support other small but very important body processes such as brain activity. The amount of this type of feed is different for each horse, breed, age, discipline and level. At peak performance a support in the recovery of the muscles is necessary. Liberated lactic acid in the muscles can be the ideal ratio between vitamin E and selenium is better removed. This reduces the risk of acidification and muscle pain. Vitamin E has a positive metabolism effect on the muscles and supports resistance. The natural antioxidants fight free radicals, promote the recovery of the muscles and strengthen the blood vessel walls and other connective tissues in the body. The Energy Classic with all essential vitamins and minerals and trace elements is also ideal for horses with little temperament that can use a bit more spice. The energy-enhancing effect contributes to a better endurance, without your horses becoming unmanageable. The Energy Classic is ideal to carry alongside the Balance horse muesli. The added living yeast cells help prevent acidification in the large intestine and stimulate the development of healthy bacterial flora in the intestines. Horses and ponies that perform an endurance performance can perform better on a feed with a lower content of soluble carbohydrates. Consider, for example, the disciplines dressage, driving and endurance. These sports feeds are characterized by a combination of soluble carbohydrates and fatty acids. Fatty acids are extracted, inter alia, from oil-rich crops such as linseed and soya. Fatty acids are also released in the large intestine during the digestion of fibers. In the large intestine of the horse lives a very extensive microflora with a very large diversity of bacteria. Some bacteria have the ability to break down fiber. Volatile fatty acids, also called complex carbohydrates, released during this process are absorbed into the blood and used as energy. This energy is released slowly in the gut so that a horse does not quickly become hot or nervous of this type of food. With an endurance performance, energy is burned in the muscles with oxygen. In contrast to peak performance, no lactic acid is produced when burning fatty acids, carbohydrates and proteins, but a combination of carbon dioxide, water and ATP (final energy). The high content of highly digestible cellulose (fiber) promotes the natural bowel function and keeps the moisture well in the intestines. During the sweating a horse loses not only fluid but also electrolytes. The addition of electrolytes in the Energy Special is essential for optimal muscle function and various cell functions. The extra added magnesium and the amino acid tryptophan have a relaxing effect on the physical and mental level. Tryptophan ensures the production of serotonin. A good serotonin content gives a calm, relaxed and balanced feeling. It helps relax muscles and promotes signal transmission in the nervous system. External stimuli have less effect and the horse is less stressed. This special sports muesli without oats contains slowly released energy. The basis of the Energy Special is formed by barley. The energy from barley is less readily available than the energy from eg oats, so that your horse remains fully manageable. Because in each discipline the load on the body and the recovery period varies, the needs for vitamins and minerals in the various muesli's have also been adjusted. For example: Released lactic acid in the muscles, can be done by the ideal ratio between vitamin E and selenium is better removed. This reduces the risk of acidification and muscle pain. Vitamin E has a positive metabolism effect on the muscles and supports resistance. The natural antioxidants fight free radicals. The Balance horse muesli can be fed as a basic diet during rest and recovery periods. In the run-up to the peak performance, the amount of Energy Classic to be fed may be increased.